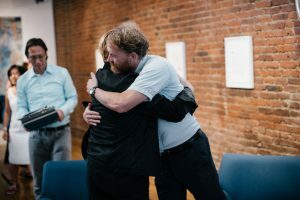 + On the first year anniversary of FULLER studio, we reflect on our inaugural conversation on the Psalms between author Eugene Peterson and musician Bono. In celebration, we are pleased to offer five new, exclusive videos from an additional interview conducted subsequently in New York. It was Bono, reflecting on his earlier conversation with Peterson in Montana, who requested more time to express how much the Psalms have influenced him. 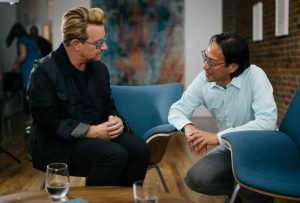 Below, Fuller Texas professor of theology and culture David O. Taylor interviews Bono in the gallery space of Fuller’s Brehm Center for Worship, Theology, and the Arts Director Makoto Fujimura. Photography by John Harrison. Special thanks to David Taylor, Brehm Texas, and Fourth Line Films for their vision for this project. Watch the documentary Bono & Eugene Peterson on THE PSALMS.